We’d love your help. Let us know what’s wrong with this preview of Suicide by Jeffrey S. Black. To ask other readers questions about Suicide, please sign up. This is a biblical counseling booklet on suicide that is a part of a series called “Resources for Changing Lives” printed by Presbyterian and Reformed Publishing. I highly recommend this series of booklets and I have found them very beneficial for my own personal spiritual growth and also as a resource in pastoral ministry. The specific topic for this booklet is on suicide. The booklet addresses those intervening and counseling someone who is struggling with wanting to commit suicide rather than This is a biblical counseling booklet on suicide that is a part of a series called “Resources for Changing Lives” printed by Presbyterian and Reformed Publishing. I highly recommend this series of booklets and I have found them very beneficial for my own personal spiritual growth and also as a resource in pastoral ministry. The specific topic for this booklet is on suicide. The booklet addresses those intervening and counseling someone who is struggling with wanting to commit suicide rather than addressing directly the person who desire to end his or her own life. I made the mistake of not reading the subtitle of this work carefully and gave this to someone I was counseling that was feeling suicidal. Nevertheless when I read this booklet I felt it was a treasure trove of help for the counselor and is jam packed with many insights despite its tiny size. In the first three pages of introduction the author Jeffrey Black describes the tragedy of suicide and how it is difficult for him as a pastor to minister to those who survived a loved one who ended his or her own life. The book then looks at the inner world of the suicidal person. I thought the author did a good job arguing of how suicide is sinful by looking at the various heart issues that motivate and drive one to the brink of suicide. The next section is titled “Common Features in Suicidal Thinking.” Here it is very insightful concerning the mind-set of one who is suicidal and those who have been at risk with suicide or have been at risk before will affirm the insights of what the author tells us. This is followed by a section on “How Can You Help?” that provides five helpful principles to help those one is counseling. The final section is on how to assess the risk of suicide which also is very helpful. As a constructive criticism the author could have defined “felt need” as some Christians would not understand what that term means as opposed to actual need and even the circumstance. I also thought it might be better to have the section on how to assess the risk of suicide be moved to the beginning of the book rather than the end. Putting it in the beginning might make readers how important the rest of the content of the book is given the level of danger one counselee faces. Plus it presents the materials in a “problem” then “solution” linear direction which helps readers track along better. Overall very helpful. Again it amazes me how much helpful materials is presented in such a short booklet; my copy has a lot of highlights and for good reasons! I recommend this for pastors, biblical counselors and regular church members too since we will also be ministering to God’s people in the church and outside our church sometime in our Christian life. Be equipped and be prepared, consider reading this booklet today! This short read is helpful for caregivers, pastors, friends and family of someone who has voiced suicidal thoughts or seems strongly moving in the direction of ending their life. Jeffrey Black gives several useful explanations as to the inner workings of someone who may be suicidal, and a few beneficial ways to engage them and seek to help them. This is a guide for the non-professional, and the author has listed several of the indicators that a person may be genuinely suicidal. Unfortunately I f This short read is helpful for caregivers, pastors, friends and family of someone who has voiced suicidal thoughts or seems strongly moving in the direction of ending their life. 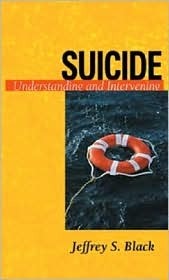 Jeffrey Black gives several useful explanations as to the inner workings of someone who may be suicidal, and a few beneficial ways to engage them and seek to help them. Not as helpful on the understanding/analyzing end, but better for helping.